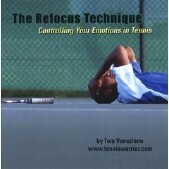 Tennis Server - Tennis Warrior - Change A Losing Shot! 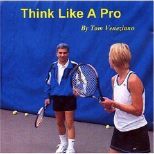 If you are consistently hitting the ball into the net on any given shot, correct the calamity by opening the face of the racket (tilting it toward the sky) and hitting the ball long. CHANGE A LOSING SHOT! I know this sounds simplistic, but most players just keep making the same mistake over and over and over again. And guess what, they get the same response over and over again - the ball goes in the net. You must learn to make a change even if the ball goes out of bounds. You are losing the point anyway so you might as well risk losing while making a racket face adjustment. Experiment! I am always amazed to watch a player hit the same spot on the same shot again and again. It never occurs to them to make a change. Everyone likes quick-fix answers; well, here is one that works! If you open the racket face enough, I guarantee you will not hit the net. You may hit the fence, the building behind the fence or a player walking by, but you will NOT hit the net. The sure cure for this malady of hitting the net is to open the racket face. I usually ask players why they would not just open the racket face and stop hitting the net. They answer meekly, "the ball may go long." So there you have it. Players would rather keep hitting the net and losing than open up the racket face and maybe hit long. It appears that a player would rather definitely lose than make a change and possibly win a point! The lesson here is simple but profound! Because of a mental quirk we humans seem to cling to old ways. We would rather lose in our comfort zone than live dangerously and make a change outside our comfort zone. Staying in our comfort zone is why it's often difficult for players to change a losing game. Yet we all know we should make adjustments in a losing game as well as a losing shot! Be courageous and try a different shot to improve your game. When I say different this can mean just a slight adjustment in your racket face. Who cares if you still lose the point. You are on the road to ruin anyway, so making an adjustment in your racket face may be the light at the end of the tunnel. If you hit the back fence, if you hit the building behind the fence or if you hit a player walking by - at least you didn't hit the net! Enough is enough! When you hit the ball four or five times into the net with the same old shot make an adjustment. Always change a losing shot.